She hates to be photographed. She lives in a constant state of denial. If she does not like something she simply turns her back and the issue no longer exists. She has ignored the very existence of Velcro for about seven years. She’s a snob. You see, my pack is made up of rejects. Velcro was an older dog when I adopted her. 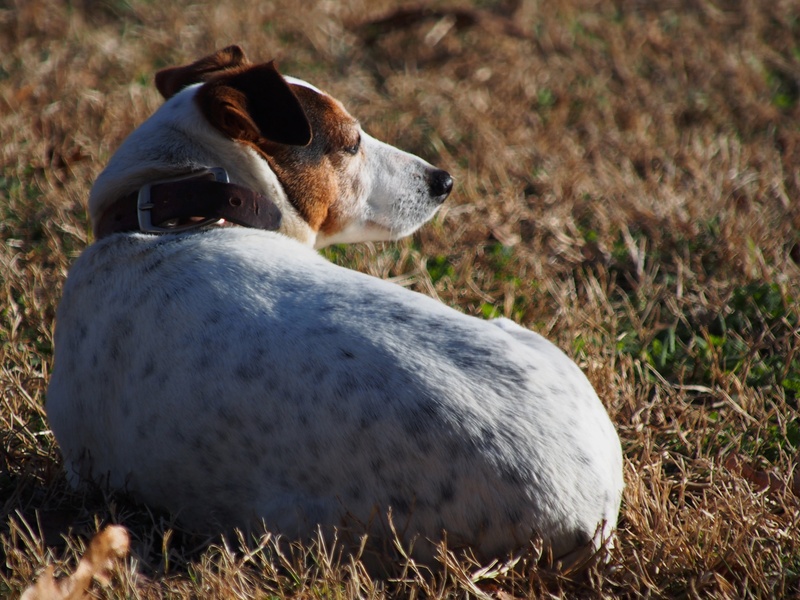 Kirby had shyness issues so the breeder wanted to “place” him with someone who understood terriers. Sunshine is a goldendoodle who was abandoned by his owners along with his litter mates at about 6 weeks. It’s a pretty motley crew except for Squeegee. Squeegee is a princess. My Pop came for a visit several years ago and fell in love with the young terrier pup I had at the time. 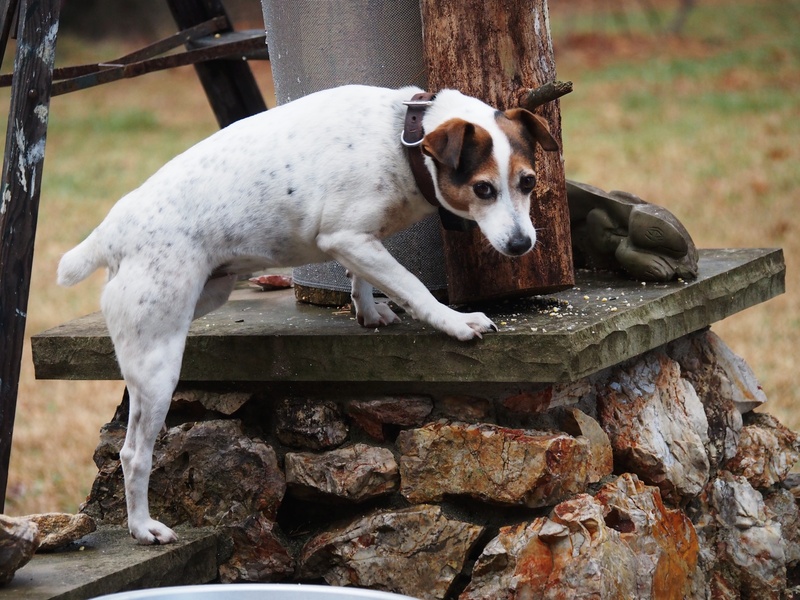 He wanted one and they were very expensive where he lived in Vegas, but here in the Ozarks Jack Russell Terriers are hunting dogs, ratters, work dogs. A pedigreed dog can be had for less than a couple hundred dollars – a third of the price in Vegas at the time. So I looked up a couple of breeders and we took a road trip to Jay, Oklahoma to look at some pups. The breeder had 2 available and one was just odd-looking – short nose, barrel chest, wide face – the other was perfectly square, a really beautiful terrier. That dog was Squeegee. Pops asked me which one I thought was the best pick and I told him to get the little square girl – she was perfect. He told me to go get the back of the car ready, he was going to haggle with the breeder over a price. Soon he walked out with both pups in hand – I guess he worked a two-fer deal. Squeegee has been the princess at my place ever since. A side note – spending your vacation housebreaking three puppies is not very relaxing. Since the housebreaking phase Squeegee has not been much of a problem except for her disdain of Velcro. She’s a happy dog who barks at deer and chases squirrels. She isn’t much of a hunter, but she does make a lot of noise. She’s the most demanding of my pack and vocalizes a lot to get you to pay attention to her. She rarely gets into things like the trash or messes up anything in the house, so it surprised me to find out that she was a thief. Is that suet on the fence post? Around the tree, on the ledge, under the limb – got it! What suet? I don’t see any suet. 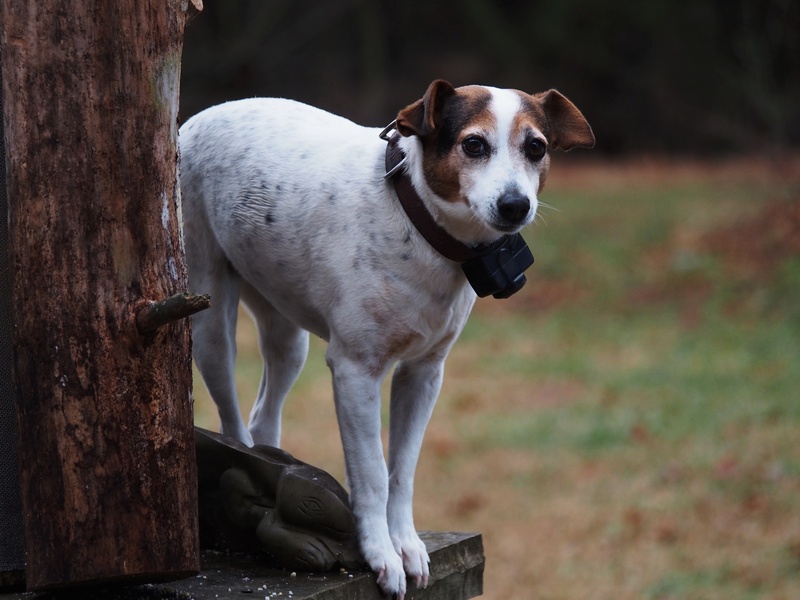 I’m just hanging out here on this fence post minding my own business. She may look innocent, but if you are missing suet you know who’s behind it. 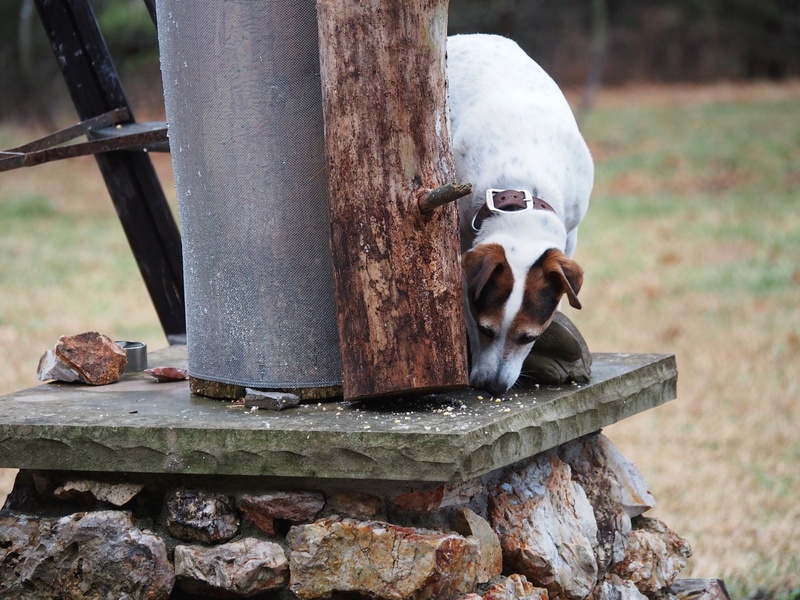 This entry was posted in birds, Ozarks, Photography, wildlife and tagged Arkansas, bird feeding, Eureka Springs, Jack Russell Terrier, Olympus, Olympus E-M5, Ozarks, photography by artsifrtsy. Bookmark the permalink. That suet is just so darn good. Ha! I know that look! Is that a little suet on your chin? Too cute. Love the names, especially Velcro. My old dog ignored every dog we had except Banjo, everyone likes him. Very cute shots here! Squeegee likes the boys, just not Velcro. They sleep cuddled back to back so she doesn’t have to look at her. I was really surprised to catch squeegee sneaking into something like this, she may have been pulling the wool over my eyes for some time now. What a character. 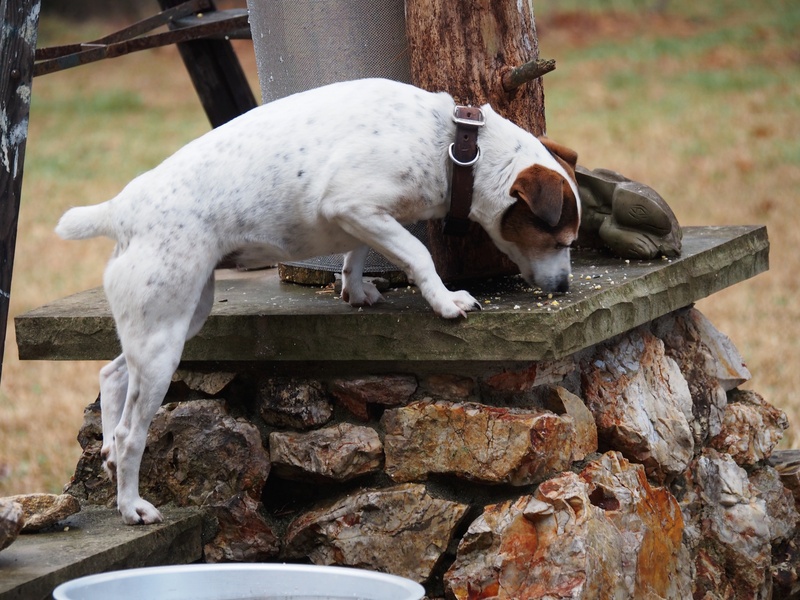 Our dog Cooper is in charge of cleaning up all the bird seed that falls when we are filling the feeders. We should have named him Sunflower! Sunflower – that works when you yell it – but not very manly. They do love those sunflower seeds though – don’t they? The suet makes everybody excited though. 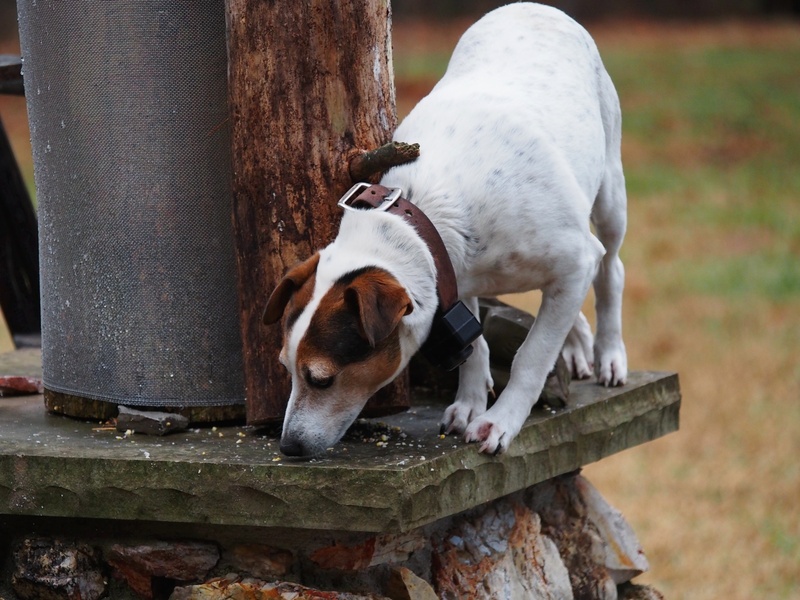 I caught Kirby climbing one of the woodpecker poles to steal some. Thank you – she is quite the character and she never shares anything so I’m certain she wouldn’t share her password. I have no idea what websites she visits while I am away at work. Oh I did enjoy this post.. and love the dog… does she tweet? Thanks Bulldog – If she tweets she has kept her twitter account hidden from me. She never shares passwords. What a fun series of images. Squeegee has the most innocent and adorable face. Yeah – she looks innocent enough. She is one of those dogs who smiles too – very hard to photograph because she hates the camera. What a little goat! 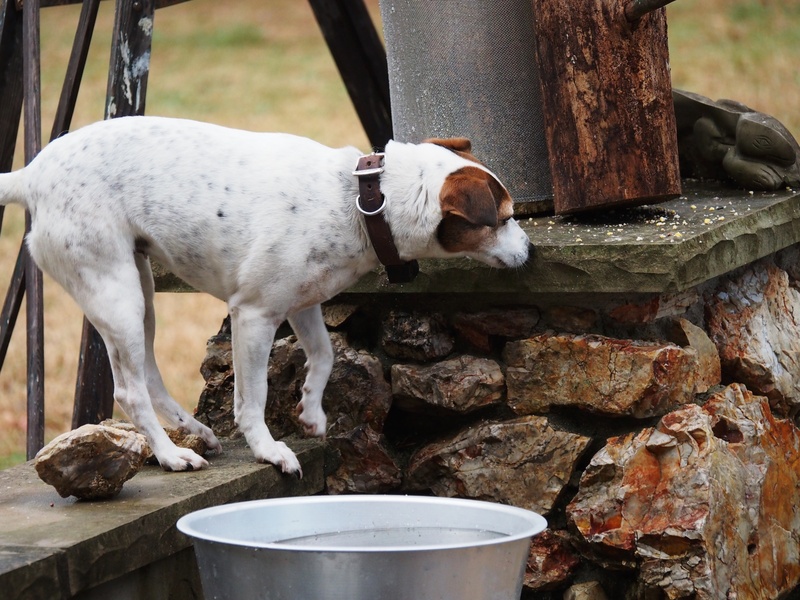 I love Squeegee….as I’ve said before….she reminds me so much of our pups! Her “cat” attitude is like “baby’s”. She is a goat – what makes it worse is that she has a fake limp – so she climbs everywhere with only three legs. She has been limping for years and the vet has found nothing wrong with her. I think she likes attention. Sugar always stands with a drawn paw….and she is fine. We call it her OCD mode. ??? They sure are, you can see her right rear leg held up in some shots. I feel so sorry for her. What a smart little doggie! I am smitten! :o) The photos are *adorable* ! :o) I love your Blog so much, Lorri. Don’t miss Squeegee. Busted…Next on 48 Hours!